If you're worried that adding Constantine to your schedule will cause some serious superhero fatigue, rest easy. The new NBC series isn't anything like the other comic book adaptations premiering this fall. It's got a lot more in common with Angel, or perhaps Supernatural, than it does with the costumed crime-fighting of The Flash (and its sister-show Arrow) or the police procedural origin story of Gotham. Of course, being different doesn't mean all that much if the quality isn't there, and Constantine's pilot is 'super' inconsistent. And yet, despite its many problems, there are enough good things about the series - like Matt Ryan as the damned occult detective - to warrant further investigation into its intriguing supernatural world. John Constantine - created by Alan Moore, Stephen R. Bissette and John Totleben - first appeared as a 'guest star' in The Saga of the Swamp Thing before Moore and Bissette developed a comic of the character's own. Hellblazer, a DC (and then Vertigo) Comic, followed the wise-cracking, chain smoking street magician-turned-demon hunter's adventures in the occult and the same goes for the small screen adaptation from Daniel Cerone with Mark Verheiden and David S. Goyer. Joining Ryan's eponymous anti-hero on the quest to redeem his soul, and the soul of a young girl he lost years earlier, are Harold Perrineau as Manny, an angel who recruits Constantine to fight in the holy war; Charles Halford as Chas, our hero's oldest mate; and Angélica Celaya as Zed, his (soon to be) partner who's plagued by visions. These visions will take the master of the dark arts and his companions around the country so they can send the evil-of-the-week back to hell. Lucy Griffiths and the always great Jeremy Davies also guest star in the pilot, which is directed by Game of Thrones's Neil Marshall, and the former is a major reason why the show doesn't really work. Almost half the episode is devoted to Griffith's Liv, and the actress simply can't compete with Ryan's charisma; not that she was given material to make it a fair fight. She's basically just a (beautiful) place to dump exposition. However, criticizing her acting and/or characterization at this point is moot because Constantine's creatives and/or executives realized this and have written Griffiths out of the show. I guess that is sort of a spoiler but it has to be said, since her sidekick would have been a major reason not to recommend the series and now it doesn't really matter. Instead, Constantine will be paired with Zed, a character from the source material which at least make the exposition arrive in conversation not a lecture. Ryan is wonderful in the lead role, bringing the right amount of rage, guilt and wit to the performance. He's fun to watch and that's the main reason why I'll be tuning in for another adventure. I am a little worried that he'll defeat every demon with a chant though. Ryan's good but not good enough to make that interesting every week. The first installment also did a fine job of setting up Constantine as both a successful episodic and serialized show. The 'villain of the week' format should work well since there are plenty of quality bad guys from the comic books to include, not to mention the potential to introduce other heroes. The overarching story is equally intriguing, although I wish we got a glimpse of the primary antagonist in the pilot. Most importantly, they got the tone right. Marshall managed to create a creepy yet cheeky atmosphere, walking the fine line that is 'fun horror' as well as leaving a terrific template for the other directors to follow. Constantine's pilot was rather shaky but there is massive potential for the future. And with NBC's recent extended order, the comic book adaptation seems to have some time to work out its demons. 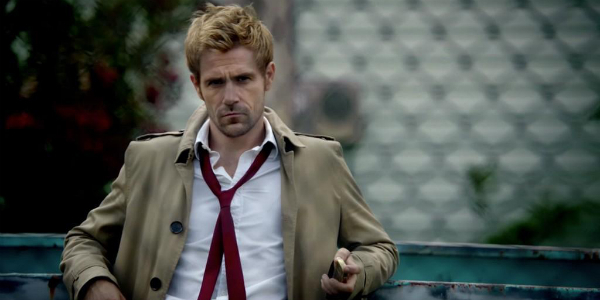 Constantine airs Fridays at 10:00 p.m. ET on NBC starting October 24. Adapted for television by Daniel Cerone with Mark Verheiden and David S. Goyer, the comic-book series stars Matt Ryan, Harold Perrineau, Charles Halford, Angélica Celaya, Michael James Shaw and Emmett Scanlan. Lucy Griffiths and Jeremy Davies guest star in the pilot.